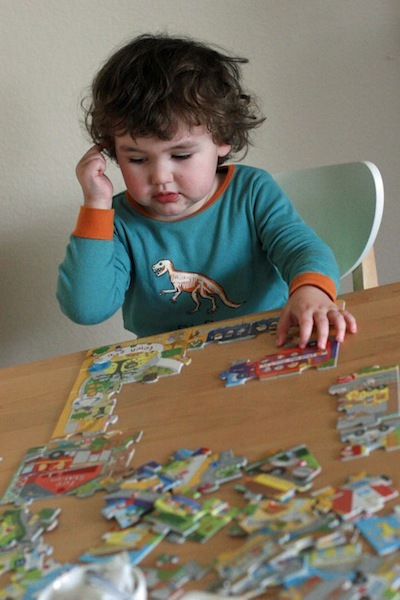 I'm happy to have a guest post over at Natural Parents Network today about "Unschooling Preschool." Mikko hard at work unschooling himself. I have a bit of an announcement to make: We've taken Mikko out of his preschool. But that's not what the article's about, so I'll get into all our reasons why another day. The article at NPN today explores what you can do if you want to accomplish the same things a preschool education does — but in a home-based, non-curricular fashion. Many people might say that preschool is unnecessary and little children can just learn as they go — and I do in fact believe that’s true! However, Sam and I have a tendency to be, um, what’s the word? Lazy, that’s it. So it’s good for us to have some goals in mind to scatter opportunities for learning in our children’s path. You can’t follow your child’s interests if you don’t offer anything interesting, right? So, with our experience of what Mikko did in preschool, and our unschooling worldview, we can now see how the two mesh. Whether your kids are enrolled in preschool or not, you’ll certainly have plenty of time interacting with them in an educational capacity in these preschool years. And whether or not you intend to continue on to traditional schooling, the preschool time is perfect for following your child’s lead and being relaxed about learning. Here are our ideas to start out with for this year. Please feel free to add yours in the comments! Copying Games: Draw a picture and leave space beside it for your little one to copy it. This builds hand-eye coordination and can be a lead-up to writing, or a drawing lesson in itself. I really loved this post! Thanks for the ideas! I'm curious as to why you are choosing to unschool? I understand pretty well, I think, what unschooling is, but I can't see how it is a good idea in the long run. How is your child to ever attend college, and pursue a presumably lucrative career without the proper pieces of paper required? And all the things you talk about doing can easily be done during family time (after school and on the weekends, summer break), so why deprive your child of the basics of socialization, structured education, and a chance at higher education? I just don't understand. "I'm curious as to why you are choosing to unschool? I understand pretty well, I think, what unschooling is, but I can't see how it is a good idea in the long run." I guess that really depends on what you see as a good outcome in the long run. Sam & I were very good students — and by that I mean that we followed all the rules and didn't understand a thing about learning, until we were finally out of school. The best way to understand unschooling to me is to look at (a) how babies learn and (b) how adults learn. (Here's an article I wrote about the latter.) No one's leading their learning, but there's no holding them back. They learn what they need to in order to accomplish what they want. "How is your child to ever attend college, and pursue a presumably lucrative career without the proper pieces of paper required?" Again, that's a lot of elements to unpack in one seemingly innocent question. As far as proper pieces of paper are concerned, pretty much all colleges and universities nowadays accept home schooled students. The requirements vary from school to school, so if our children were interested in a particular one, they would look to see what was required there. Many homeschooled/unschooled children take the SAT or ACT, for instance, and many have a transcript that their parents have crafted (sometimes more like a portfolio and sometimes including outside grades from, say, community college classes). I plan to formally keep track of my children's learning for that purpose. Each U.S. state varies also with regard to what it requires of homeschoolers. In Washington, we will have either a yearly assessment (standardized test) or an evaluation by a certified teacher. I might be skimming over these details, because they're not relevant for a few years yet (schooling is not mandatory until age 8), but we will be monitored and Mikko's progress will be recorded. I don't want to speak to all families and all situations, but I really feel that Mikko and Alrik will have a good environment with Sam and me to learn what they need to and choose to, and that a lot of worries about college and "lucrative careers" are instilled by the culture rather than reality. Neither college nor lucrative career is essential to wellbeing, but if they choose that for themselves, they can have it, even as unschooled kids. Many successful, fascinating people never had formal schooling, or left at an early age. (Most women throughout history, for one!) It's only relatively recently that we've been conditioned to think that formal education is the only route to success (which is defined differently by every person, anyway). As for "structured education," I have a lot more I could say about this subject, but I'll just leave with a thought: Public education's purpose is to make workers. It's not to make learners. I want more for my kids than to have them be turned into good employees. Will unschooling get them into college? I've gone through a lot of mind shifts while thinking about unschooling, so I'm asking you rather joltingly to come along with me. I understand if you're not there, though. It's definitely a new way of thinking and valuing. @Melissa - The stories of 3 unschoolers and how they're making their dream careers into reality. This article also includes some examples of how unschoolers can get into college. This had been a concern of mine, so I really appreciated this one: Zero Tuition College: The TEDx Talk. I can't add to the above, which is brilliant, because I'm still researching, myself. Like the previous poster mentioned - these are all things you can do on your off time....which is why the adage rings true: not all teachers are parents, but every parent is a teacher. 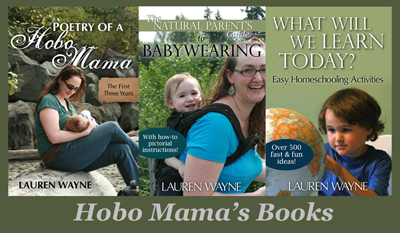 I'll be following your unschooling exploits, Lauren! Lauren, thank you SO much for this beautiful post, as well as your thorough comments! I have to admit, not yet being a parent, and knowing that I want to persue natural parenting I sometimes find myself wondering how some of my ideals will play out in reality. I wonder if some of my parenting plans are simply the best choice for me, or if they truly are the best for our future children. The one I struggle with most is homeschooling. While we're not making any decisions until we have to, my husband and I are very much leaning towards homeschooling, although both of us were also 'good' students in public school. The problem both of us had with being 'good' students in the public system was that we did what we were told. Immediately. Without question, for fear of punishment. Doing what I was told lead me to go to University, get a degree in Sociology. And then end up in the job market, with a degree with almost no direct career path, and even more so wasn't what I truly was passionate about. Even though I was given freedom to choose what to take in University, I had no idea what it was because I never had reason or experience with choosing what *I* wanted when it came to my learning. Now, at the age of 29 I am back in school at community college, starting a nursing degree. Had I have been given more free choice to explore different things when I was younger, as well as the freedom to know it was OK to process what *I* truly wanted for a minute, I'm sure I would have come to this decision long ago, and would be further ahead. My husband's story is very similar. For that reason we both want to give our children the time, freedom and reassurance that they can explore whichever path they choose to. I think it's normal to question things, and wonder "How does that work..." for me the big one I'm still playing with in my head is "How will I homeschool my older children while still tending to the needs of younger babies that may come along..." While I'm far from having the answers to these questions, knowing that there are social supports both from our community, teachers, government, and other mothers and fathers with similar beliefs is what makes me know that as a community of those who want the best for our children we will obtain exactly that. I guess I just keep telling myself, no parent can ever gaurantee they're not messing up... but for me I know if I parent with my heart and instincts I will do right by my kids. congratulations on your decision — i'm sure you'll love it. Lauren, thank you for your comments! I really enjoyed reading them. I feel that exact way about public school. I was scared to make mistakes. I was afraid to earn lower than a 'B' mark (thus ruining my high honor roll streak). College wasn't much different. I definitely don't regret college although I'm not using my degree in a traditional way. But yeah, I agree, I'm not a learner. I have a hard time hunkering down and focusing on a new task. I'm still scared to try new things because I may fail. I remember a professor of mine describing public school as an assembly line, just as you described, to churn out workers in the most efficient way. The Public School Ideal: having the opportunity to understand different perspectives from teachers and classmates. The Public School Reality: too many students falling through the cracks. And from my experience, I didn't gain new perspectives from my classmates and professors until college when students actually had an opinion and professors could actually lecture intelligently. I admire you and Sam for doing what you want, researching it, and executing it for your son. Good luck! I really enjoyed reading about unschooling. I am curious to know more about your view on pre-school versus home schooling and see where your experience takes you.